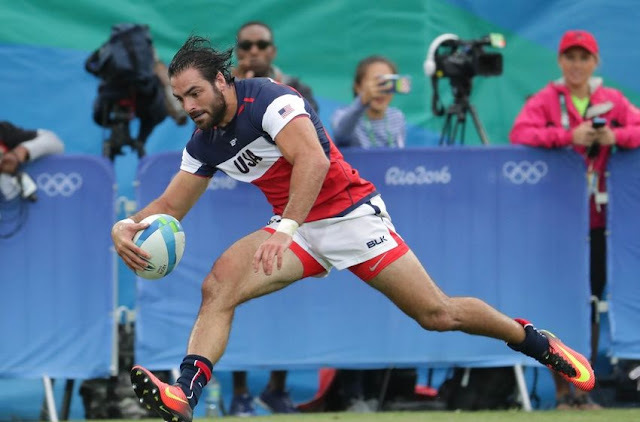 A last minute try from Patriots crossover star Nate Ebner proved to be too little too late for the USA Rugby squad as they fell to tournament favorites Fiji 24-19. Unfortunately, the loss eliminated the Eagles from medal contention at Rio. Ebner started and played the entire game for the underdog US squad, who jumped on Fiji early to score the first try (the rugby equivalent of a touchdown) on a beastly individual effort from Danny Barrett. However, Fiji responded by scoring the next two tries, including one that closed the first half, leading to a 12-7 halftime lead. Perry Baker, who was briefly a Philadelphia Eagle before a knee injury ended his football career, opened the second half scoring with a try that regained a 14-12 lead for the Eagles. However, Fiji once again responded with consecutive tries, bringing the score to 24-14 and putting the US in desperation mode. That turned into another moment for Ebner to shine. Chris Lyles fielded the ensuing kickoff and drew multiple defenders to him before dumping the ball off to Ebner, who came up with great support and took off untouched down the right sideline for the try. A successful conversion kick on the ensuing play would have made the score 24-21, a margin close enough to advance the Eagles to the quarterfinals, but Madison Hughes hooked the difficult attempt wide left. The game ended soon after, when a lost ruck allowed Fiji to take possession and kick the ball out of bounds for a game ending stoppage. The final score was 24-19. While the disappointing loss ended Team USA's medal contention, they would go on to play Brazil merely hours later in the consolation bracket. This game went much better, with Ebner setting up one of speedster Carlin Isles' three tries in the 24-12 victory. They'll kick off tomorrow at noon against Spain with a ninth place overall finish on the line. Highlights of the narrow defeat to Fiji, including Ebner's try, can be found here.